As Passover rapidly approaches, cleaning and preparing for the holiday is a topic that comes up more and more. It seems like a huge undertaking and most people dread Passover cleaning– me included. But this year, I’m a little excited. I’ve divided my cleaning into two parts, my kitchen and the rest of my apartment. I’ve decided to make my Passover cleaning into a more traditional spring cleaning. And what better way to welcome springtime than with a fresh and clean apartment? As for the kitchen, it’s always quite a project. I started last night with a play from my college roommate’s playbook. I took a box and placed it on the center of my kitchen floor and started throwing all of my chametz into it. I filled the box pretty quickly, now I know why she put the box out about a month before Passover. There were a lot of staples (beans, pasta and rice) in the box, but there were also some hidden treasures in the back of my cabinets that I had completely forgotten about. I’ve decided to turn this box of chametz into a challenge. Before Passover starts, I’m going to try and use as much of this food as possible. Additionally, I am not going to buy anymore chametz, which adds to the difficulty because I finished my last slice of bread today. The good news is that there is a lot of food in the box for me to work with. To complete this challenge I am going to get creative with my recipes. This is the perfect opportunity for me to try new things. 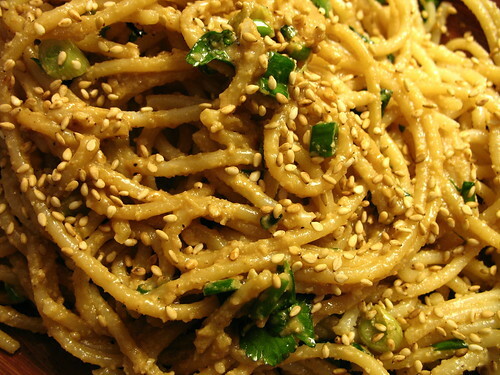 Some of the items I know how to prepare in different ways, for example, I am making sesame noodles for dinner tonight. It is going to be harder to use up some of the other items. For instance, the only way I know how to cook rice is to boil it. I usually serve rice with a main dishes but the rice itself is nothing special. 10 days and counting; let the cooking begin! Bring a pot of water to a boil and cook pasta. Put the peanut butter, soy sauce, vegetable oil, sesame oil and cayenne pepper in a small bowl and whisk together, until peanut better is mixed in. In a large bowl mix the sauce mixture with the cooked pasta. Garnish with sesame seeds and scallions. You must not have tasted a fresh batch of jasmine rice with its unique fragrance! You could make a diverse variety of pilafs (hot) or salads (cold) with rice, substituting the rice for similar shaped pastas. Or try the Chinese technique of stir-frying cold rice and adding veggies, eggs, or meat. Hannah: After Passover is over, I will have to get some jasmine rice. I have never tired cooking with it before. Beans and rice are not chametz, and there is no reason whatsoever to get rid of it prior to Passover. As long as it is not eaten during Passover, there is nothing wrong even with owning it. There is nothing wrong, of course, with challenging yourself to get rid of old food, using new recipes, etc., but don’t confuse kitniyot with chametz, and don’t feel obligated to get rid of it, since there is no halachic obligation to do so.